At least 200 people were killed in 24 countries last year in retaliation for standing up to environmentally destructive industrial projects. 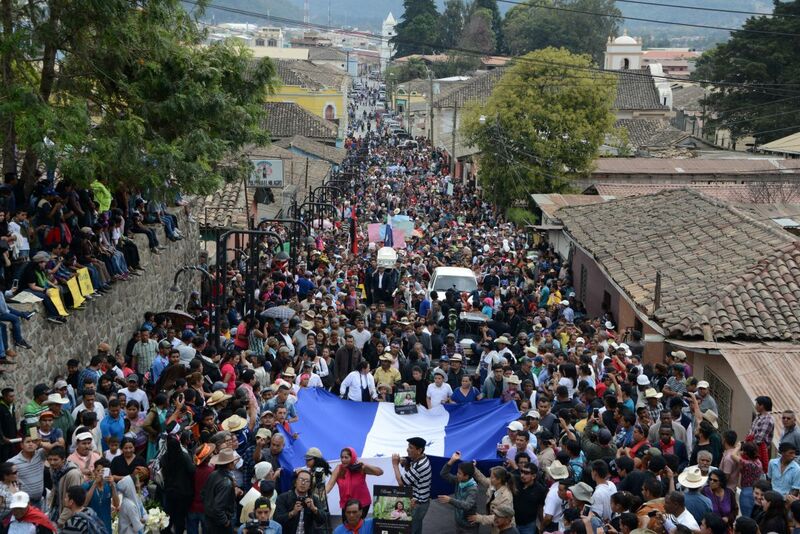 People attend the funeral of murdered indigenous activist Berta Caceres on March 5th, 2016. Last year, London-based non-governmental organization Global Witness published a report that showed 2015 was the deadliest year for defenders of the environment since the group started tracking killings of activists in 2002. But that record didn&apos;t last long, as the number of environmental and indigenous activists murdered in 2016 was not only higher, but even more widespread across the globe. According to a new report released by Global Witness, at least 200 people were killed in 24 countries last year in retaliation for standing up to environmentally destructive industrial projects. That&apos;s up from 185 murders in 16 countries in 2015. That means that four defenders of the land, wildlife, or the environment were murdered every week in 2016, and the authors of the Global Witness report note that these numbers may actually be far from complete: "With many killings unreported, and even less investigated, it is likely that the true number is actually far higher." Some 33 murders were linked to the mining sector, making it the most deadly industry to oppose. But killings connected to logging companies are on the rise, with 23 in 2016, compared to 15 the year before. Another 23 deaths were associated with agribusiness projects, 18 with poachers, and seven with hydroelectric dam projects. Private security forces and hitmen hired by industrial actors were responsible for 52 of the killings, Global Witness found. Some 40 percent of the victims of lethal anti-environmental violence were indigenous people. When an industrial project is forced on an indigenous community—often without their free, prior, and informed consent—protest is typically the only recourse available to the people that have, in many cases, occupied their land for generations. Far from protecting indigenous peoples&apos; right to protest, however, government forces frequently act in complicity with industry: Police and soldiers are believed to have been the perpetrators in at least 43 of the murders recorded last year, the report states. Park rangers are facing increasing threats as well, with 20 killed in the line of duty in 2016—nine of those in the Democratic Republic of Congo alone. 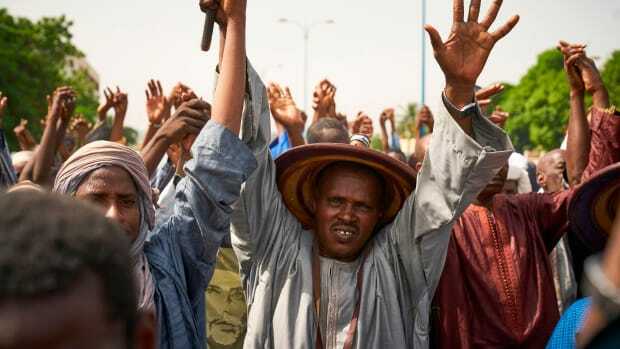 "Brave activists are being murdered, attacked, and criminalized by the very people who are supposed to protect them," Ben Leather, a campaigner with Global Witness, said in a statement. "Governments, companies, and investors have a duty to guarantee that communities are consulted about the projects that affect them, that activists are protected from violence, and that perpetrators are brought to justice." More than half of all killings of environmental activist last year occurred in Latin America. Brazil was once again the deadliest country in the world to be an activist, with 49 murders, many of them committed by loggers and landowners in the Amazon. Meanwhile, Colombia saw a spike in the number of killings, which reached 37 last year, an all-time high for the country and the second most recorded by Global Witness for a single country—mostly due to conflicts sparked as Colombians return to areas previously held under guerrilla control only to find extractive companies and paramilitaries aggressively disputing their claims to the land. 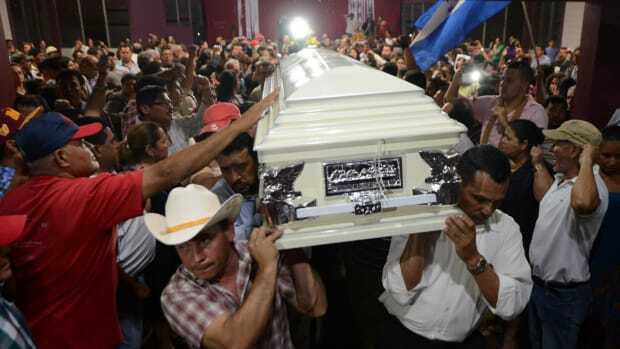 Nicaragua, where 11 activists were killed, had the highest per-capita death rate for activists last year, but Honduras still has the most murders per capita over the past decade, with 127 activists having been killed since 2007—including indigenous rights activist Berta Cáceres, who was assassinated in her home in Honduras in March of last year, sparking an international outcry. On the other side of the globe, killings in India tripled to 16, most of them linked to mining projects, heavy-handed policing, and the repression of peaceful protests. The mining industry is also seen as having driven the 28 murders of activists in the Philippines last year. As activists face an increasingly deadly threat from the very industries they oppose, however, they are all-too frequently criminalized for their activities. This trend is evident even in the United States, which didn&apos;t record a murder of an environmental activist last year but did see a number of other violent tactics used to suppress and criminalize protests against an oil pipeline being built near the near the Standing Rock Sioux Reservation in North Dakota. "It is increasingly clear that, globally, governments and companies are failing in their duty to protect activists at risk," the report authors write. "They are permitting a level of impunity that allows the vast majority of perpetrators to walk free, emboldening would-be assassins. Incredibly, it is the activists themselves who are painted as criminals, facing trumped-up criminal charges and aggressive civil cases brought by governments and companies seeking to silence them." A collaborative project between Global Witness and the Guardian that aims to track every environmental activist killed in 2017 found that 98 had already been murdered as of May 31st, putting this year on path to set yet another record. While federal governments have a duty to protect activists under international law, private businesses must also help tackle the root causes of the problem, the authors of the report add, by "guaranteeing communities can make free and informed choices about whether and how their land and resources are used." Investors and development banks must also take a look at their portfolios and stop funding projects that are harmful to the environment and human rights, the authors write. "The battle to protect the planet is rapidly intensifying and the cost can be counted in human lives," Global Witness&apos; Ben Leather said. 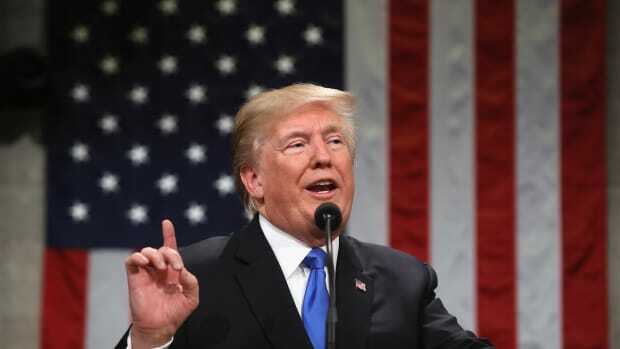 "More people in more countries are being left with no option but to take a stand against the theft of their land or the trashing of their environment. Too often they are brutally silenced by political and business elites, while the investors that bankroll them do nothing." Mike Gaworecki is a journalist based in Brooklyn, New York. He has covered environmental science, forests, and climate issues for over a decade. 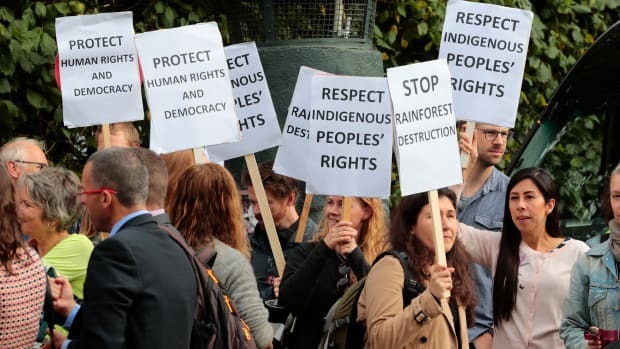 A new report from the United Nations finds that there has been a sharp increase of instances of physical violence and legal prosecution against indigenous peoples in countries across the globe. 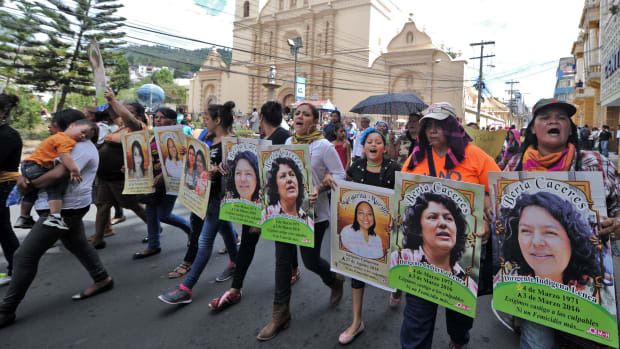 The murder of environmental activist Berta Cáceres leaves many demanding answers. Norwegian government officials are warning Temer that his country risks losing millions in financial aid that Norway pays to Brazil to help rein in deforestation in the Amazon. 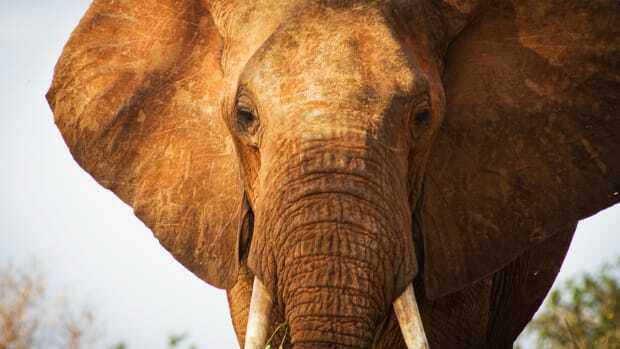 The Chinese government has said it will rein in the smuggling and illegal sale of ivory, but those enforcement efforts do not appear to have reached the town of Shuidong.